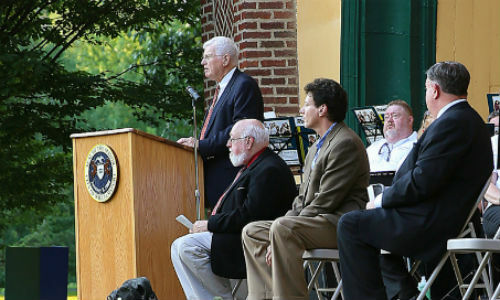 Williamsport’s own Repasz Band has been accorded a great honor and is to be commemorated with a historical marker by the Pennsylvania Historical and Museum Commission. The historical marker will be unveiled and dedicated in a special program at 7 p.m. Tuesday at Brandon Park. The marker will be a roadside monument very near the Brandon Park Band Shell. The marker itself is a one-of-a-kind custom metal sign, cast in a foundry and then painted and sealed in the deep blue and gold of the official state colors of The Commonwealth of Pennsylvania. 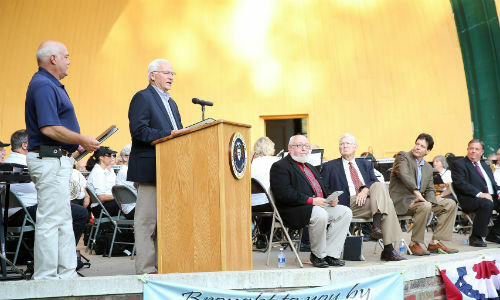 Remarks shall be proffered by Pennsylvania Historical & Museum Commissioner Bill Lewis, Senator Gene Yaw, Representative Jeff Wheeland and Mayor Gabriel Campana, followed by the Repasz Band playing its signature march. 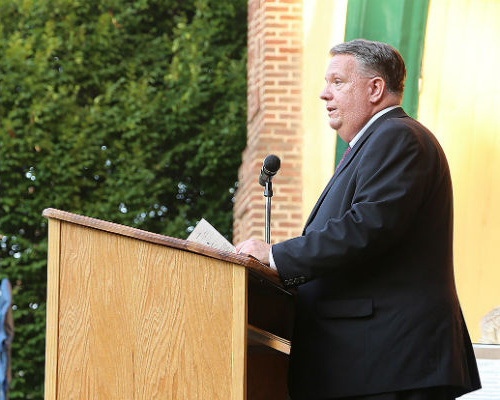 The keynote address titled “The Repasz Band: A Cultural Icon” will be delivered by Dr. John J. Piper Jr., Professor of History and Dean Emeritus of Lycoming College. 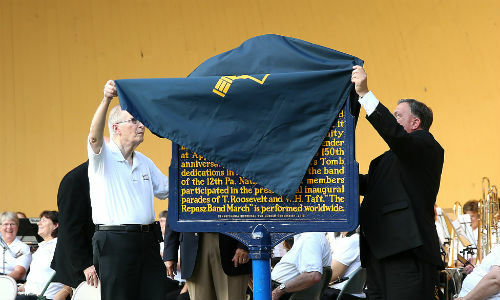 The marker shall be unveiled and its text read out loud to the public for the first time by the band’s director Albert J. Nacinovich to be followed with closing remarks made by Gary Parks, executive director of the Lycoming County Historical Society. The Repasz Band will tie the ribbons on the star-spangled occasion by performing several works from its vast historical and contemporary repertoire. Williamsport’s own Repasz Band has been highly honored to be invited to perform for the Pennsylvania Music Educators Association 2017 Conference in Erie, PA, on April 20, at the Erie Bayfront Convention Center. In addition to the usual conference fare of symposiums, banquets, awards, and general meetings, this conference includes eighty-five professional development sessions for in-service music educational professionals, and also features performances by 35 outstanding ensembles from all genres of music and age levels. Each one of those 35 is considered exemplary within their genre and invitation to perform is aimed to illustrate what can be accomplished with standards of musical excellence at work. The Repasz Band is humbled and grateful to participate in this opportunity to show what a multigenerational community band can do. The Repasz Band presently includes 17 former All-State Band members and 18 active or retired PMEA members, and is proud to note that its senior director of over 45 years, Mr. Albert J. Nacinovich, is both a past president of the PMEA, and a 2009 inductee to the PMEA Hall Of Fame. The PMEA is the sponsoring organization of the entire district, regional and state bands and choruses in the great Commonwealth of Pennsylvania, and sponsors multitudes of opportunities for musical expression for Pennsylvania’s students throughout nearly their entire school careers and beyond. It almost goes without saying that nearly every musically active adult in the Commonwealth has been touched by PMEA events and member teachers in one way or another. NEW DAY OF THE WEEK, NEW TIME! The Repasz Band will present its 2017 Spring Concert on Sunday, April 9th, at 3 p.m., at the Community Arts Center, at 220 W. 4th Street, Williamsport. Launching this stellar concert will be the Band’s performance of Dmitri Shostakovich’s Festive Overture, transcribed by Donald Hunsberger. Composer Shostakovich worked at a time in Russian history wherein one’s own literal life or death was under the condition of whether party bosses liked your work or not. Several friends of his “disappeared” under these conditions, never to be seen again. A sudden situation became a crisis when the leader of the Bolshoi Theater Orchestra was ordered to premiere a new work celebrating the October Revolution… at a concert in three days! Shostakovich magnificently rose to the occasion with his Festive Overture, a piece of incredibly intense excitement, dynamic energy, and incisively deft musical expression! Widening the international flavors of this concert are Julie Giroux’s Italian Rhapsody and Franco Cesarini’s Greek Folk Song Suite. The former is like a happy musical tour of Italy and was commissioned by great Repasz Band friend, Colonel Arnald Gabriel, and dedicated to the honor and memory of his parents. No Repasz Band concert would be complete without a fine representation of traditional marches and this one is no exception. The Band will present a march triumvirate tour de force of John Phillip Sousa’s Saber and Spurs, Julius Fučik’s Florentiner March, and, of course, the Band’s own signature march, The Repasz Band, by Lincoln and Sweeley. Musical gravitas of devotion and contemplation will be provided for by Dan Forest’s arrangement of The King Of Love My Shepherd Is, and Claude T. Smith’s powerful take on The Navy Hymn, Eternal Father, Strong To Save. Finally, lest anyone come away unfulfilled, works from the ministry of musical silliness includes Paul Yoder’s Pachinko, a musical trip to a Japanese pin ball arcade at peak hours, and Rick Dejonge’s A Toonful Tune, a rampant distillation of cartoonic conventions that will make the listener recall the great cinematic cartoons of yesteryear. Both of these works include virtual shooting galleries of special effects from the Band’s overworked and underpaid percussion section. Musical direction for this year’s Spring Concert is provided by the Band’s luminous conducting squad of Mr. Albert J. Nacinovich, Mr. Jeffrey Dent, Ms. Jessica Lewis, and Mr. Theo Lentz. More comprehensive information about the Repasz Band is available at: http://www.repaszband.org .